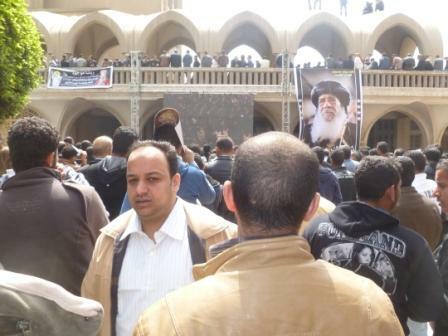 The atmosphere at Pope Shenouda’s funeral today was not what I expected. At first it was dull, and then sympathetically chaotic. Entrance to the church itself could only be secured with a personal invitation, so I made my way early to the courtyard of the Coptic Orthodox Cathedral to witness the swelling throngs. 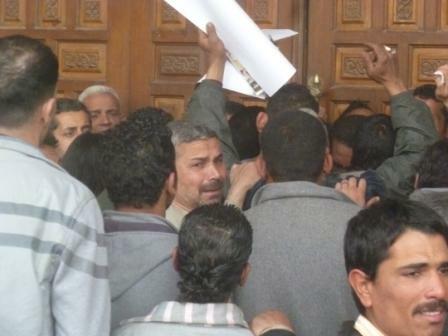 Over the past few days since his death thousands upon thousands of Copts gathered to collectively mourn both outside and inside the church, where Shenouda’s body was sitting-in-rest, perched upon his papal throne. The only issue: The crowds did not come. The inside of the church was packed with dignitaries, as was visible from the giant movie screen set up both in the courtyard and in the garden below. I maneuvered to a platform by the side of the stairs, to try to capture a picture of when the whole area would lurch with mourners. As the sun beat down and I tired from standing as the funeral service proceeded, it became apparent the crowds were not coming. 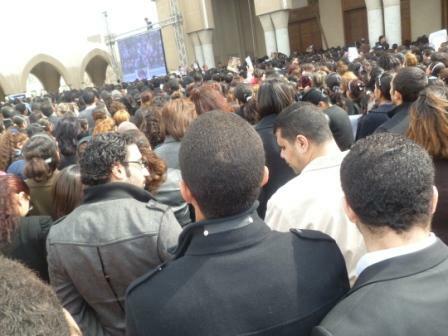 The upper level of the courtyard at the entrance to the church was packed, but with hundreds, not thousands. This entryway was shut to seal off the proceedings, while dignitaries entered from a smaller door to the side. I walked around wondering. The entrance I came through amid tight security had now been shut, as had the other gates to the cathedral. 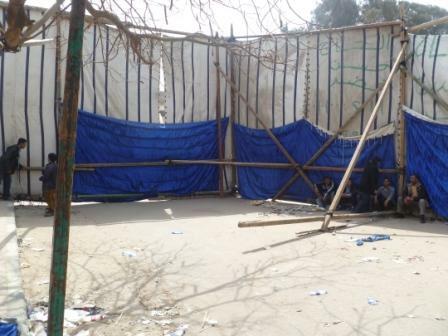 Temporary cloth walls cordoned off other areas. Apparently, authorities wanted to keep the official funeral as peaceful and ordered as possible. 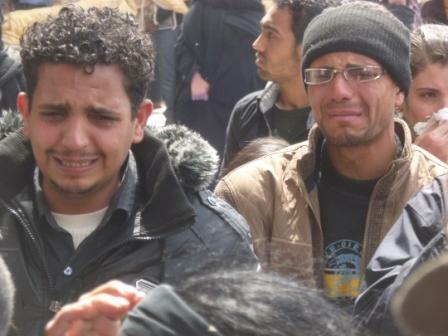 The day before three Copts died and dozens were injured as a semi-stampede erupted among those trying to pay their last respects. At this point I wondered what would happen if all the doors remained closed. Despite the fewer numbers there were still over a thousand people outside the church, not including the several thousand inside. Might there be another stampede when the service ended? Yes, but in the other direction. Near the close of service the funeral leader read off the list of names present. These included top military brass, major presidential candidates, senior figures from the Muslim Brotherhood and other parties, and ambassadors from around the world. Nearly all major religious denominations were also present. It was an impressive list. But not to the crowd waiting outside. 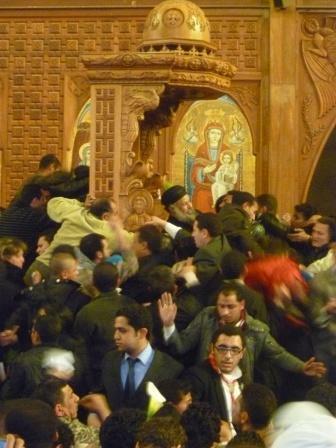 They listlessly attended to the names, and awaited the final farewell video of Pope Shenouda. When it came, they raised their hands and tearfully waved him goodbye. Then when they were bid farewell in peace, the crowd rushed across the entranceway courtyard to the balcony for one last glimpse of his physical body. He was taken from his throne and escorted outside to the street, where he would be flown for burial at St. Bishoy Monastery in Wadi Natroun. When this scene ended, as most were unable to see, a small contingent started to physically break down the cathedral door to enter inside. Only the rapid reaction of the church’s scouts prevented this from happening. I did not quite notice how it happened next, only that a few minutes later another door was forced open. It may have been aided by those inside seeking a more rapid exit, but before long the crowd was jamming itself through the narrow entrance, past the cries of those inside forbidding the action. 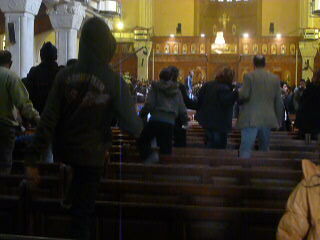 Once inside, all propriety was lost as many started climbing over the pews to get to the front. 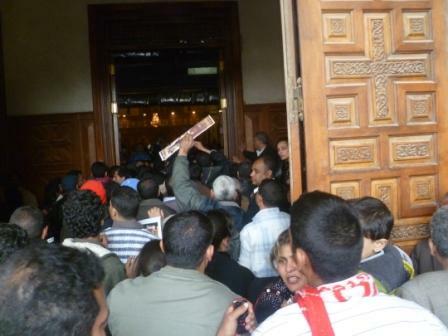 The object was Pope Shenouda’s throne. 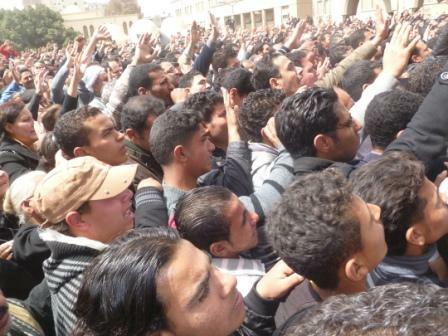 Before too long scores of Copts had surrounded it, trying to get close enough to touch. These were seeking blessing, as the pope had only minutes early been occupying the seat. Most would never get that close to either a pope or his chair again. The Coptic Orthodox Church believes itself to be an extension of the original apostolic authority. As Peter became pope in Rome, so did Mark the gospel writer in Alexandria. Their power given to work miracles continues today. I cannot say whether the following is official doctrine or not, but one mourner told me that no injections had been given the corpse of Pope Shenouda. He died three days ago but his body has not yet begun the process of decay. He has sat-in-state since then, for public display and affection, as a mark of God’s approval. I found the example of the priest in the video to be inspiring. His spiritual leader had just died, all order was breaking down inside the cathedral, and he sat patiently in the papal chair serving the crowd. Instead of rebuking them, he assisted the gathering of tissues from those who were too far away, touched the chair, and gave them back. May God bless him. Today was a sad day, and I wish I was not so occupied with gathering pictures so as to more fully join in. The Bible commends us to mourn with those who mourn. At times I did, especially when witnessing others shed tears. But for the most part I was too distracted with the surroundings. May God bless the Copts, give them space to mourn and sympathy from their neighbors, and an eventual next good pope to come.